In clear English and 240 illustrations, here is everything you are not supposed to know about Nikola Tesla. As famous as Edison in the 1890’s, Tesla soon became invisible in the official history, and his later inventions became taboo in the official electric technology. Here are the inventions that got him into trouble. Here also are instructions for building Tesla coils and other projects. Many of the taboo inventions went into patents. These have been translated from the legalese into clear English, the drawings into lucid illustration. 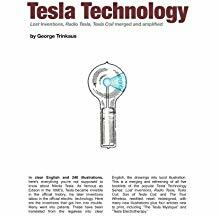 This is a merging and refreshing of all five booklets of the popular Tesla Technology Series: Lost Inventions, Radio Tesla, Tesla Coil, Son of Tesla Coil, and The True Wireless, — reconsidered, reedited, reset, and redesigned with many new illustrations plus four articles new to print, including The Tesla Mystique and Tesla Electrotherapy. Continuously printed since 1988, this is the best-seller of the famous Tesla Technology Series from High Voltage Press. Here are Tesla’s suppressed inventions economically published all in one place in clear English and 42 illustrations. Disk turbine, Tesla coil, high-frequency lighting, magnifying transmitter, radio, wireless power, free-energy receiver. The only systematic intro to Tesla technology. Lucid, literate, astringent, this is the original that broke the ice. Accept no potboiler imitations, however fantastic. Quality booklet, offset printed, saddle-wired, 60# stock, 2-color cover. Invented by Nikola Tesla back in 1891, the Tesla coil can boost power from a wall socket or battery to millions of high frequency volts. This is the only systematic treatment of the Tesla coil for the electrical nonexpert. Third edition, countless printings, still selling. 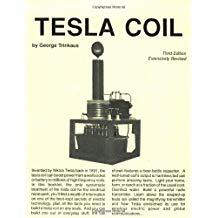 Here you will find a wealth of information on one of the best-kept secrets of electric technology, plus all the facts you need to build a Tesla coil on any scale. And you can build one out of everyday stuff. A well-tuned coil’s output is harmless but can perform amazing tasks. Disinfect water. Generate ozone. Build a powerful radio transmitter. 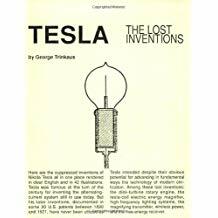 Includes an introduction to the magnifying transmitter and how Tesla envisioned its use for wireless power and global communications. Who owns the ether? 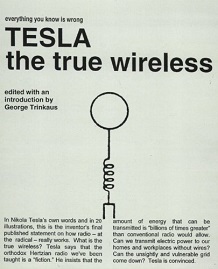 In clear English, 66 illustrations, and a minimum of math, this booklet details the radical radio technology of Nikola Tesla. Early elemental wireless devices like Tesla’s and others shown here are fascinating and worthy of study because they remind us that powerful radio technologies can be so simple and accessible. Here is Tesla’s peculiar radio in the context of the conventional. Modern radio took a lot from Tesla, but what did it ignore? Tesla’s potent transmitter produced high-voltage, sudden-pulse disturbances of low frequency conducted through the ground. His wireless power works on the very same principles. Not a reprint. Completely reset and redesigned with an introduction and explanatory notes by the editor. 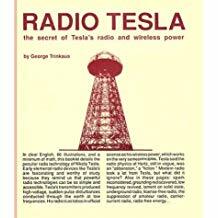 First published in 1919, this is Tesla’s final published statement on how radio, at the radical, really works. Everything you know is wrong. Tesla says the orthodox Herzian radio theory we’ve been taught is a fiction. He insists that the amount of energy that can be transmitted is “billions of times greater” than conventional radio would allow. Can we transmit electric power without wires? Can the unsightly and vulnerable grid come down? Tesla is convinced. This is one writer’s attempt to give a voice to the unspeakable philosophy of the ruling system. Humanity is a management problem. I am the true religion. I am the true progressive. I am the true environmentalist. What are the 13 rules of rule? 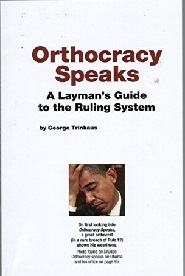 .What does Orthocracy say about the issues of the day?